These are Grade 23 Solid Titanium flat bottom dermal tops with cz gem. Internally threaded, gems are not press fit, do not autoclave. 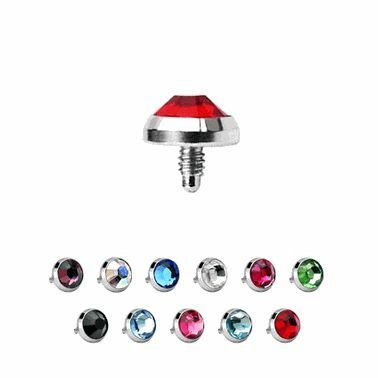 You will receive 11 dermal tops in assorted colors (1 of each color). These dermal tops are nickel free. We use 6AL4V-ELi IMPLANT GRADE titanium in all of our Grade 23 Titanium body jewelry.